Large 3/4 bed townhouse with prrivate pool - Property for sale. 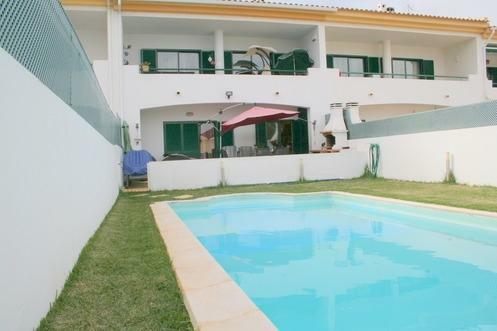 Full Description: Impressive large town house with 3/4 bedrooms over 3 floors, parking and own pool located in a popular area on the edge of Albufeira. Great access to all amenities and only 5 minutes drive to beach. Level access to this property is from the large private terrace, parking and car port area. The spacious entrance hall has marble stairs and from here, through a feature opaque glass/wood door is the internal hall for the bedroom area. There is hall storage, receiver for the door entry system and doors to the 3 double bedrooms. All flooring on this level is made from real wood. The master which is en-suite has fitted wardrobes and opens to a large balcony with far reaching views. The balcony overlooking the pool provides seating and lounging area. The fully equipped en-suite is tiled with bath and shower over, toilet, bidet and wash hand basin. Bedroom 2 with two built-in wardrobes also opens to the balcony. Bedroom 3 has built-in wardrobe and overlooks the front. All bedrooms have air-conditioning. Also on this level is the family bathroom fully tiled with bath and shower over toilet and wash hand basin. From the main entrance hallway descend the marble stairs to the lower level. In the lower hall is located video entry system and off this inner hall is the cloakroom with toilet and wash hand basin and also houses the washing machine and tumble dryer. The fitted kitchen has floor and wall units, electric oven and ceramic hob with chimney style extractor, fridge freezer and dishwasher. Off the kitchen is a pantry with shelving and houses the central vacuum system. The kitchen has double doors leading to the patio and pool area. The spacious lounge/dining area has a feature log burner, ample space for the large 8 seater dining table and spot lighting which is dimmer controlled to provide ambient lighting. The lounge also has doors leading to the patio and pool area. Outside there is a Summer kitchen with BBQ and sink, storage for garden equipment and large patio area offering plenty of space for relaxing and entertaining. Plus a good size pool with lawned area to either side. The feature of this property is the third floor, accessed via a wooden staircase from the entrance hall, this space provides an office/study area with air-conditioning unit, a 4th bedroom with velux window and a large dressing room/storage area. There are many ways you could use this valuable space as there is extensive shelving and hanging space. A deceptively large property ideal for permanent living in a popular residential area or great for a large holiday home.